Found along the Pacific Coast from British Columbia to California. Grows across a wide range of moisture regimes; Occurs from near sea level to 3,000 feet (0-914 m). It is rare in the Cascades but grows throughout the Coast Ranges and the central Sierra Nevada. It is a particularly common constituent of brushfields which develop after timber harvest in the Coast Ranges of Washington and Oregon and in the foothills of the Washington Cascades. Requires moist, acidic soil and can thrive where pH ranges from 4.3 to 5.2; tolerant of both sun and shade, though plants do best with shade. Common in coniferous forests at low elevations, especially along edges and clearings. Also found near beaches in the salt spray zone. Persists in many climax stands but also grows in early seral communities. certain mature Sitka spruce (Picea sitchensis), Douglas-fir (Pseudotsuga menziesii), western hemlock (Tsuga heterophylla), and western redcedar (Thuja plicata) forests of the Northwest. Common understory associates include salal, red huckleberry (Vaccinium parvifolium), western swordfern (Polystichum munitum), Oregon oxalis (Oxalis oregana), Pacific rhododendron, hazel (Corylus cornuta), thimbleberry (Rubus parviflorus), bog Labrador tea (Ledum glandulosa), ovalleaf huckleberry (V. ovalifolium), deer fern (Blechnum spicant), and annual grasses. Unlike most other western huckleberries, evergreen huckleberry lacks rhizomes. It reportedly possesses a well-developed rootcrown and sprouts from this structure after aboveground vegetation is damaged. Seeds of most Vaccinium spp. are not dormant and require no pretreatment for germination if planted in the fall after collecting. Seeds to be sown later may require cold-stratification for 2-3 months. seed, however seedling establishment is rare in most western huckleberries. Cuttings root fairly sporadically, and should be taken July to October. Reestablishment by seed, if it occurs at all, is likely to be slow. Young plants can be salvaged, but they should be under one foot tall. (Frequently, these will turn out to be new shoots of a mature plant reviving from deer browsing or logging, and will die from lack of roots. Keep soil moist, pH low. To 1.5 to 15 feet (0.5-4.6 m) in height. 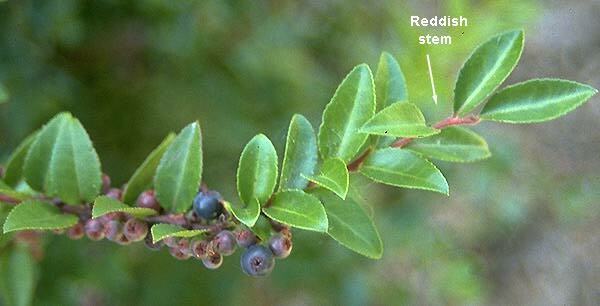 Plants often become spindly and clambering with extremes of either moisture or shade; Evergreen huckleberry is frequently dwarfed in height on cutover lands because of excessive exposure to sun. Early growth is generally very slow. Data compiled by Mike Cooksey, 22 May 2003.